Forward Head Posture – Think of someone standing tall with perfect posture, and you probably imagine a spine appearing “straight as an arrow.” However, your doctor at Family First Chiropractic teaches patients that a normal, healthy spine has three unique curves, which are essential for balance and posture. While side-to-side spinal curves, such as scoliosis, are abnormal, front-to-back curves are not. These curves help the body carry its weight and distribute it down through the pelvis. The three curvatures are: a bend of the neck with the apex toward the front of the body (cervical curve), a bend in the midback (thoracic curve) with the apex toward the back of the body, and a bend in the low-back (lumbar curve) with the apex toward the front of the body. Cervical kyphosis, often termed “military neck,” can progress to the point where the curve in the neck actually reverses, going in the opposite direction from its normal, healthy state. This reversal is also known as forward head posture (FHP). Forward Head Pressure can cause vast degenerative effects in the spine of the neck, such as speeding arthritis, chronic pain, limited range of motion and increasing risk of strain. The good news is that Forward Head Pressure may be reduced, or even corrected in many cases. Because of the amount of time most people spend hunched over desks and computers, forward head posture is one of the most common findings in patients cared for by your doctor at Family First Chiropractic. 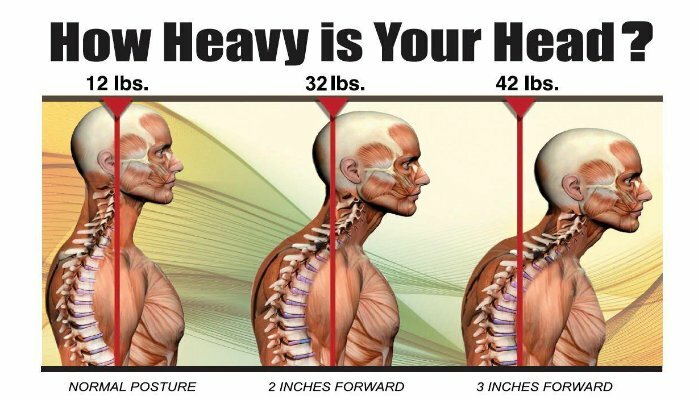 When the neck has a normal curve, the weight of the head is balanced and muscles endure only minimal strain. However, if the neck is straight or in a forward head posture position, constant strain is placed on joints. Joints that are strained continuously are predisposed to arthritis, which can even begin at early ages. By upsetting the balance of the spine and the muscles that are attached, forward head posture also dramatically increases the risk of neck muscle strain. With forward head posture, neck and shoulder muscles are constantly working to prevent the head from falling completely over. Muscles that were designed to stabilize the neck and head now must support the weight of the neck and head throughout the day. And you thought you were over-worked — imagine how overworked the neck and shoulders must feel! Doctors of chiropractic are concerned about the known and unknown side effects of drugs to treat attention-deficit/hyperactivity disorder (ADHD). That’s why your doctor at Family First Chiropractic is intrigued by preliminary research linking a reduction in forward head posture to a reduction in ADHD symptoms. One case study followed a 5-year -old boy with ADHD who was treated unsuccessfully with Ritalin®, Adderall® and Haldol® for three years. A chiropractic exam revealed a significant cervical kyphosis for which the youngster subsequently received 35 chiropractic sessions over eight weeks. The results exceeded anything the child’s parents ever imagined. As their son’s neck curvature was corrected, his ADHD symptoms improved dramatically — his behavior “vastly improved,” and his facial tics disappeared. After 27 chiropractic visits, the child’s pediatrician concluded that the child no longer exhibited ADHD symptoms. Shortly after, his pediatrician recommended discontinuing all ADHD medication. The 5-year-old’s success in the above story is not unique. For decades, chiropractic care has helped countless FHP sufferers. In chiropractic school, doctors of chiropractic spend years studying the spine and techniques to maintain its natural curves. One technique, called chiropractic adjustments, involves using gentle and effective maneuvers to correct vertebral subluxations. Vertebral subluxations are areas of the spine where motion is restricted. They occur when bones (vertebrae) are out of alignment and are linked to forward head posture. In one study, 30 patients with reduced cervical curves received chiropractic care, which included chiropractic adjustments and a special type of cervical traction for FHP. Each patient was matched with a “control” subject who received no care. After 38 visits over 14.6 weeks, the chiropractic group had “statistically significant improvements” in pain ratings and head angle. Control sub-jects reported consistent pain and no change in cervical curve or alignment. Twenty-one (70 percent) of the chiropractic subjects were followed for an additional 14 months. All subjects maintained the correct neck curvature and pain reduction (J Manipulative Physiol Ther 2003;26:139-51). In addition to chiropractic care, doc-tors of chiropractic often recommend ergonomic changes. For example, when you sit down to read or work, do you tend to adopt a “gooseneck” position with your head jutting forward? Over time, this position can increase chances of FHP. The solution? Try to keep your head aligned with your shoulders, with the middle of your back fairly straight. As you sit, it may help to visualize the three natural curves in your spine from neck to lower back. Also, invest in a properly designed seat to support the spine’s natural curves. One report reviewed studies that assessed head, spine, pelvis and lower extremities while subjects were seated. Millions of children worldwide use backpacks every day, but just how safe are backpack loads on neck and head posture? Carrying heavy loads places additional stress on a child’s rapidly growing spine, making it prone to neck and spine changes. In one study, researchers assessed approximately 1,000 students — aged 12 to 18 years from 10 different high schools in Adelaide, South Australia — with and without their school back-packs. When the students carried heavy back-packs, “significant changes” were visible in their head and neck angle. The youngest students in the study dis-played the greatest posture changes (Spine 1999;24:2262). Of course, eliminating backpacks isn’t practical, but limiting their weight reduces forward head posture risks. Biomechanical data suggests a maximum backpack load of 10 percent to 15 percent of body weight. That means simply that if your child weighs 100 pounds, his or her pack should weigh a maximum of 10 to 15 pounds. However, another review of backpack-load studies questioned this limit. Right now, whether you’re sitting or standing, assess your neck posture. Is your head leaning forward with your neck and shoulders tense? Or is your neck straight without its proper curve? How does your family’s neck posture rate? Even small postural misalignments can eventually lead to pain and health problems. Schedule an appointment today for a complete postural assessment. We’re your partners in spinal health and overall wellness. Optimal Health University™ is a professional service of PreventiCare Publishing®. The information and recommendations appearing on these pages are appropriate in most instances; but they are not a substitute for consultation with a health care provider. Optimal Health University™ may be photocopied (NOT re-printed) exactly as they are published noncommercially by current subscribers ONLY to share with patients or potential patients. Optimal Health University™ may NOT be reprinted in any print or electronic publication including newsletters, newspapers, magazines or Web sites. Any other reproductions are subject to Preventi-Care Publishing® approval. Copyright, 2017. Preventi-Care Publishing®. 1-831-313-0335.